Heroes, hedgehogs, and brawlers unite. Retrogaming fans rejoice! Sega announced that it will bring stereoscopic 3D versions of three co-op Sega Genesis classics to the Nintendo 3DS eShop starting in July. These aren't just any old Genesis games, either - they're among the greatest games to ever be released for Sega's 16-bit console. Sega's release slate kicks off in July with the launch of 3D Streets of Rage 2. Considered by many to be one of the best beat-'em-ups of all time, Streets of Rage 2 established the Sega Genesis as a 16-bit powerhouse, delivering massive character sprites, four playable characters, and surprisingly complex brawling mechanics. The lineup continues in August with 3D Gunstar Heroes, an updated version of developer Treasure's acclaimed 1994 run-and-gun shooter. Sega will then wrap up the trio in September with 3D Sonic the Hedgehog 2, which appears to be some sort of platformer about a blue hedgehog and his flying fox companion. Never heard of that one, but it sounds delightful. 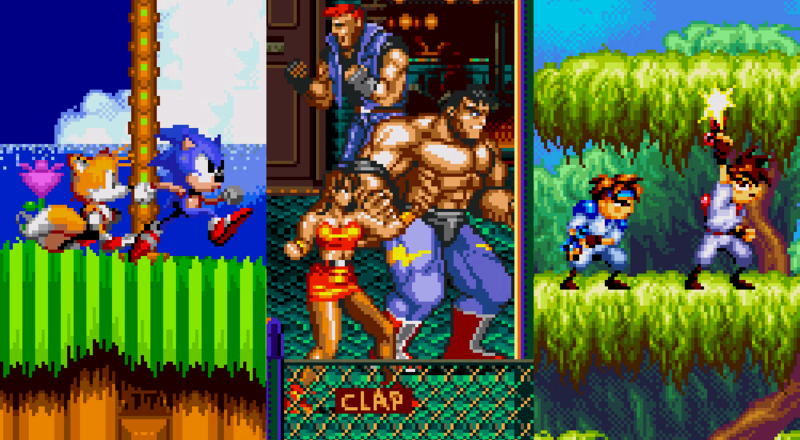 If you're a retro fanatic, you'll recall that all three of these games feature two-player co-op modes, which will be retained in Sega's 3DS revamps. Like previous Sega Genesis-ported eShop releases such as 3D Streets of Rage, you'll need a second 3DS and an additional copy of each game in order to team up in their system-linked multiplayer modes. Page created in 1.1040 seconds.